The beautiful Tahquamenon Falls Brewery & Pub invites you to come and experience an unique brewery with fine dining and rustic charm. 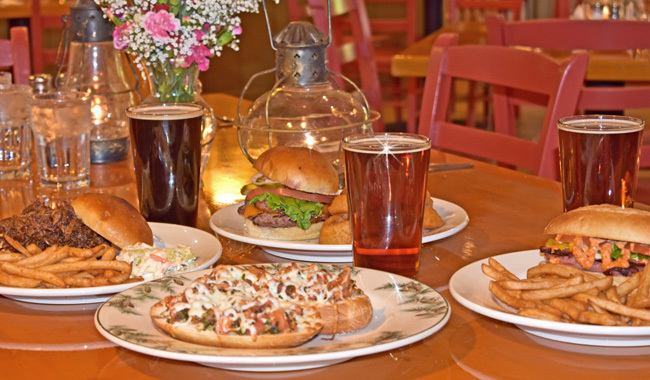 The Tahquamenon Falls Brewery & Pub offers a fine selection of micro brewed beers and delicious food choices. Built with the founder's vision, this is a special place that echoes the Tahquamenon Falls and the surrounding virgin forests. 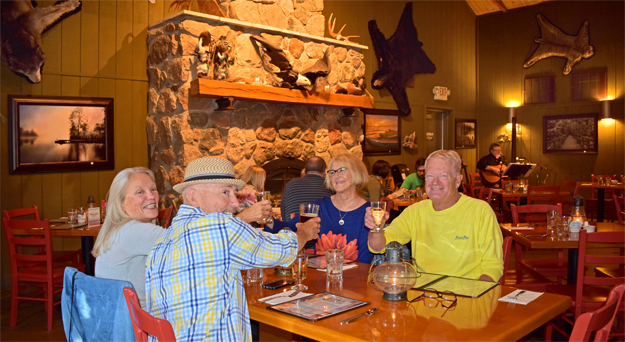 Visitors come from all over the world to experience our Upper Peninsula Restaurant and the distinctive quality of our Harvest Wheat beer, Wild Forest Mushrooms, a UP Pasty, Fruit of the Forest Pie, and Pork Tenderloin Medallions—just to name a few. Our famous and locally caught Whitefish will fill your vacation with a fantastic food experience. Each meal is carefully prepared with fresh herbs, spices, and garnished with vegetables. 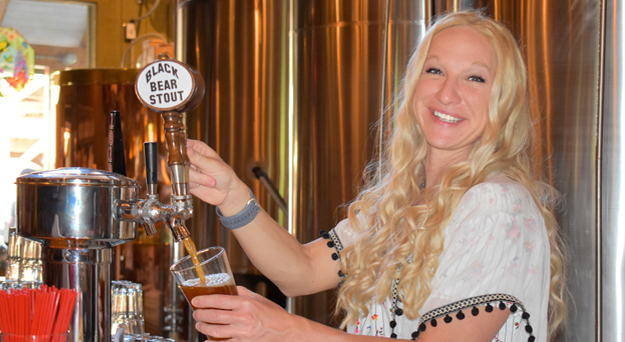 The Tahquamenon Falls Brewery & Pub has an atmosphere unlike any other. Rustic decor, a large stone fireplace, mounts, and art will be a delight to view during your visit. The spacious bar and restaurant can accommodate groups of many sizes. In 1990, the grandchildren of Jack and Mimi Barrett rebuilt Camp 33 and dedicated the new structures to the many whose foresight and philanthropy made possible the experience we all enjoy today. In 1996, the brewery & pub were built in keeping with the founder's vision. The focal point of all structures is the fire...a logging camp must! The warmth of the fire can now be enjoyed in all seasons. The surrounding State Park and Camp 33 echo these visions and together bring an experience for all to enjoy. Visitors experience a place that is warm, beautiful, charming, and historical. Our Upper Michigan Brewery is unique. The rustic long bar and micro brewery equipment tempt your interest immediately. Our micro brewed beers are available in classic collectible 1/2 gallon bottles featuring our logo. We are committed to making your visit a great experience! Guests of this Upper Michigan Restaurant and Brewery will also have the opportunity to experience our expansive Camp 33 deck with fireplace and the Camp 33 Gift Shop. "I love this place! Best Blueberry Ale and Patsy in the UP. Aside from the fact that you can see the beautiful falls here, the Brewery is a cool place. Many local mounts displayed on the walls along with local artwork that you can purchase. Located next door to the Tahquamenon Brewery and Pub, the Camp 33 Gift Shop is one of the Upper Peninsula's finest shops. 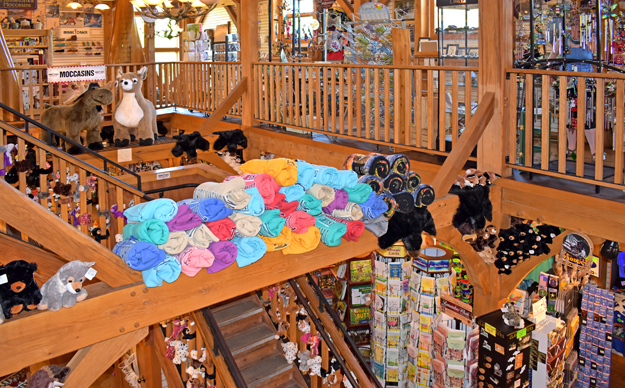 Camp 33 carries a rich variety of quality apparel that include hoodies, hats, T-shirts, pajamas, along with a huge selection of shoes, purses, jewelry, stuffed animals, toys, and handcrafted goods. Merrell brand shoes, purses, hats, fanny packs, backpacks, and many accessories are one of the featured items at the gift shop. There is also a large selection of Minnetonka Moccasins, FitKicks, canvas art, candles, carvings, mugs, glasses, sun glasses, locally made baskets, blankets, gift cards, & jewelry just to name a few. Please visit the Camp 33 Gift Shop page to learn more about this exciting Upper Peninsula Gift Shop.